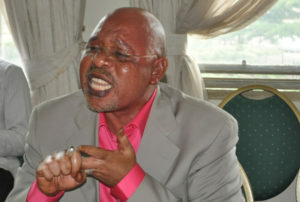 Internal Affairs minister Gen. Jeje Odongo has denied army siege on Parliament. File photo. KAMPALA–Internal Affairs minister Jeje Odongo has denied accusations that soldiers this morning were caught hiding inside both the Catholic and Anglican Chapels of Parliament. Odongo, while addressing the House on the orders of Speaker Rebecca Kadaga, said it is true unknown people were found in the chapels, but added that these were not external soldiers. Odongo’s comments came after Speaker Kadaga demanded to know who the strangers in the churches were, having in the past few days banned external security agents from the House. “If these people were parliamentary police, why were they eating inside the chaplaincy? If you have come to pray, you don’t eat. I want to know who these people were before we proceed,” Kadaga said. But minister Odongo denied claims that the soldiers were found eating inside the chapel. He said that when he received information, he went down to the chapels and found that the said intruders were in fact parliamentary policemen. “I went there to find out if there were people other than the authorized policemen. I went with the commandant of Parliament police and we found that they were policemen eating but not in the chapel,” Gen. Odongo said. 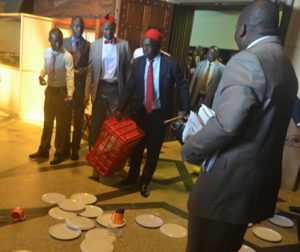 MPs seizing the utensils that were found in the chapels. Courtesy photo. The minister’s response angered some of the MPs, who heckled him, with MP Barnabas Tinkasimire referring to the minister as a liar. “We went there and picked hundreds of plates and cups. We were intercepted but we overpowered the policemen,” he said, before presenting the said items on the table. Government Chief Whip Ruth Nankabirwa, sighting a stalemate, advised the Speaker to allow more time for the matter to be fully investigated. “This happened a few hours ago and you as the Speaker have not had time to investigate. The Sergeant at Arms and the Minister of Security should be given time to investigate and we come to the bottom of it,” Nankabirwa said. Speaker Kadaga ordered the Clerk of Parliament to prepare a report on what transpired. Speaker Kadaga this morning (Tuesday) suspended the House to 2:00pm to clarify on claims that soldiers had taken over the places of worship in Parliament and could not allow anyone to access them. The contentious matter was raised by Hon. Lucy Akello, the head of the Catholic chaplaincy, who told the house that she was informed by the cleaners that the place was occupied by soldiers and were not allowed access to it yet they were supposed to have prayers by 1:00pm.